Junior Achievement leading energy companies. Son of Washington Duke and his second wife, Artelia Roney Duke, Buck (as James was called) received an peripatetic education in local academies, the New Garden School in Greensboro (now Guilford College) and the Eastman Business College in Poughkeepsie, New York. He grew up in the family's business – farming and later hand-manufactured tobacco products. At twenty-eight years old, Buck opened a branch of the family's factory in New York City. With mass-production techniques and substantial marketing campaigns, the family produced half of the country's total production of cigarettes within five years. A "tobacco war" raged among the five principal manufacturers. In 1887, Duke declined to respond to the media about his cutthroat business tactics. "I don't talk, I work." In those pre-antitrust days, Duke emerged as the president of the American Tobacco Company, which within a decade became a multinational corporation. Through numerous foreign and domestic combinations, Duke interests controlled the manufacture of a variety of tobacco products until the United States Supreme Court in 1911 ordered the dissolution of the tobacco trust for restraint of trade. 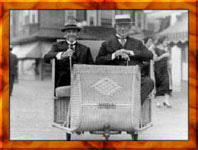 Buck's older brother Benjamin Newton (pictured left with James to his right) had gotten into textiles in the 1890s. The burgeoning textile business in the Piedmont region of North Carolina needed both water power and electricity. In 1905, the Dukes created the Southern Power Company to produce hydroelectric power. The company is now known as Duke Energy. By 1925, Southern Power was servicing more than 300 cotton mills, other factories, cities and towns in both North and South Carolina. In December, 1924, Buck created The Duke Endowment as a permanent trust fund with designated beneficiaries. 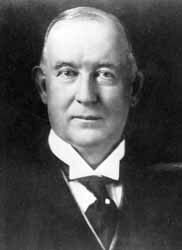 In 1892, Washington Duke had helped a Methodist-related institution, Trinity College, relocate to Durham, and since 1887 Ben had been a member of the school's Board of Trustees. A new university built around Trinity was to be the prime beneficiary of the Duke Endowment, and at the insistence of Trinity President, the college was re-chartered as Duke University in honor of Washington Duke and his family. One of the largest U.S. foundations, Duke Endowment benefits non-profit hospitals, child care institutions, rural Methodist churches and retired Methodist preachers in North Carolina, and four universities: Davidson College, Duke University, Furman University and Johnson C. Smith University.